Mumbai: A much-touted joint venture between the Wadia Group and Singapore Airlines’ engineering arm SIA Engineering Co., for opening an aircraft maintenance and an aerospace training centre in India, has hit a major roadblock owing to differences of opinion. “The joint venture project has not taken off yet due to differences in opinion. The Wadia Group has not agreed to the terms and conditions put forth by the company," said an SIA Engineering executive who does not want to be identified because of the sensitivity of the issue. “Key executives of SIA Engineering would be meeting the Wadia Group on Monday. The joint venture may be called off if there are no amendments made to the existing conditions." Another person familiar with the development, who does not want to be named, said the cost of the project has gone up substantially from the initial estimates. The project structure will also result in increased cost for servicing the fleet of GoAir, run by the Wadia Group. He added that some of the clauses are not favourable to GoAir. Jeh Wadia, managing director of Go Airlines (India) Pvt. Ltd, which runs GoAir, insisted “the joint venture with SIA Engineering is well on track," adding that “the information about dropping the project is purely market speculation." Daniel Wong, business development manager of SIA Engineering, would only say:“I cannot comment on this project." 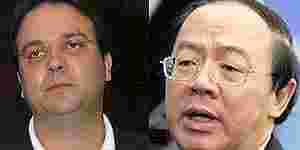 Mutual discord: GoAir managing director Jeh Wadia (left) and SIA Engineering president and CEO William Tan Seng Koon. William Tan and the Wadias signed an MoU in July 2006. Wadia had then said that both the companies would sign a definitive agreement for the transaction soon. SIA Engineering’s core business is in the MRO of aircraft, engines and related components. The Wadia Group has a large presence in textiles to real estate, besides running GoAir. The group and SIA Engineering had begun this initiative in the wake of 500-plus more passenger planes expected to come into India in the next three-four years. SIA Engineering president and chief executive officer William Tan Seng Koon signed a memorandum of understanding with the Wadias in July 2006. Jeh Wadia had then said that both the companies would sign a definitive agreement for the transaction shortly. There is a rush to set up MROs in India. Aircraft makers such as Boeing Co. and Airbus Industrie SAS are setting up two MROs and GMR Infrastructure Ltd, which has the mandate to operate the soon-to-open Hyderabad International Airport, also plans to start an MRO with Lufthansa Technik AG,?a German airplane repair firm, at that airport. Bangalore-based Taneja Aerospace and Aviation Ltd is also setting up an MRO that will initially repair smaller and regional jets. Meanwhile, regional airplane makers such as Embraer of Brazil and Bombardier of Canada are also mulling MROs in India in the backdrop of the boom in the regional aviation sector.